Traders who believe in price charts make them work. Chartists try to find repetitive price patterns which have a high degree of accuracy and usually are self-fulfilling. Gaps and specific formations frequently meet these criteria. Gaps are one of the most easily recognizable technical indicators. A gap is simply an empty spot formed on a chart when price lines don't overlap the previous day's price action. Sometimes market psychology changes overnight or over a weekend. That change in psychology forces prices to open and stay above or below the previous day's range. 'Gaps are filled' is another time-tested rule of the market. That is why gaps become future price objectives. Quite often, prices retreat to fill a gap in a bull market before continuing the move. Likewise, prices often rally in a bear market to fill gaps. Gaps may serve one of three purposes. They are used to spot the beginning of a move, to measure a move and to signal the end. There are four different kinds of gaps: common or temporary, breakaway, measuring or runaway, and exhaustion. The most frequently occurring gap is the common gap. When this gap occurs because of a slight change in psychology, traders expect it to be filled soon. Once a gap is filled, it no longer has significance. The early portion of the soybean chart on this page shows common gaps during the December and January period which were later filled. The breakaway gap on this chart occurred on May 7 and begins a major bull move. Breakaway gaps often occur after a stretch of sideways trading and in the leading days of an uptrend or downtrend. This type of gap remains unfilled for a long time. It sometimes is difficult to tell right away that it's a breakaway gap and not a common gap. When the market fails to fill this gap after a couple of weeks, this confirms the breakaway gap. A measuring gap typically occurs in the middle of a price move and predicts how much farther the move will go. It is also called a midpoint gap and a runaway gap. 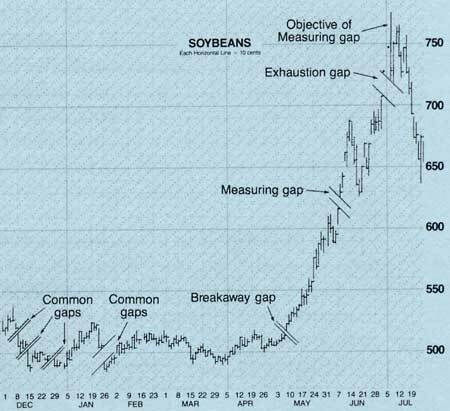 On this soybean chart, the measuring gap, which occurred on June 8, left an empty spot from $6.16 to $6.26. The April 5 low at $4.90 marked the beginning of this move. The distance from the low at $4.90 to the measuring gap is $1.26 to $1.36. Adding this distance to the measuring gap projects a move to at least $7.50. Whether you add the distance to the top, bottom or middle of the measuring gap depends on your preference. An exhaustion gap shows frustrated bears giving up and aggressive bulls trying to make the market go their way. It is the first sign of sputtering before the end. Though prices may go higher after an exhaustion gap at the top, the rally will not last long before the market dies. An extreme exhaustion gap may form an island reversal. What about gaps that remain unfilled? They become future chart objectives.If gaps are unfilled when a futures contract expires, there are usually corresponding gaps on the charts of subsequent contract months. Gaps also appear on longer-term charts such as weekly commodity charts, but gaps on monthly charts are rare because they generally are constructed to avoid gaps caused by contract changeover. Like those on the daily charts, gaps on weekly charts are also "made to be filled". A downtrend may slide to a slow, gradual halt in the saucer bottom formation. Open interest and volume follow the same pattern as prices in this formation, reflecting speculator disinterest in a market with little action and little profit potential. 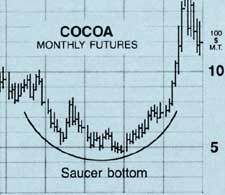 Our example on the monthly cocoa chart took three years to form. Saucer bottoms on daily charts may take at least four weeks to become visible. Although this bottom formation doesn't meet the requirements of other bottom formations, it's just as significant in signaling a trend change. Usually, the longer it takes to form a saucer bottom, the more violently prices will rise out of their lows. 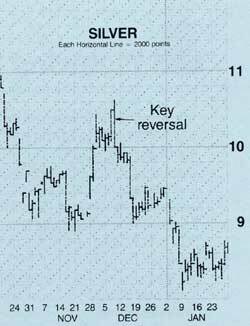 One of the most easily recognizable technical signals in trend change is the key reversal. A key reversal often has an unusually wide trading range. Its requirements are a day's range outside the previous day's range with a close higher than the previous close for an upward turnaround and a lower close for a downward turn. Here again, this chart formation reflects market psychology. A key reversal is the climax of a period of buying or selling fever. In extremely volatile markets, two or more key reversals may occur. The key reversal on the silver chart defined the top of its rally and signaled a fall in prices. To be a valid key reversal top, trading volume must be heavy and the daily trading range should be wide. 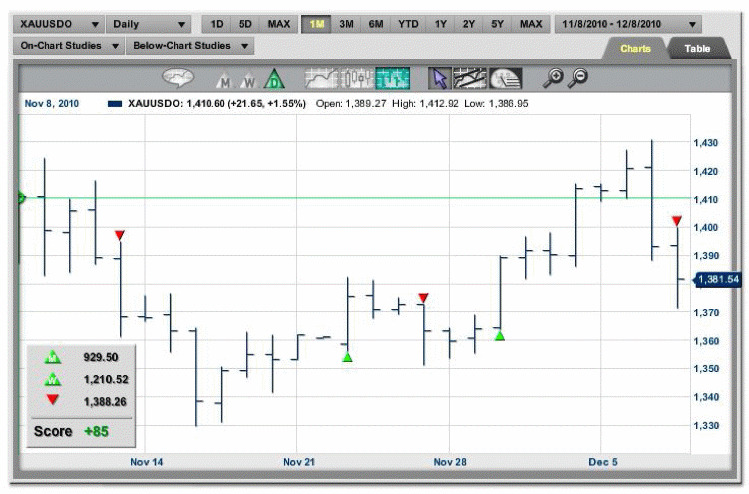 Prices first surge to new highs, but fall back and close lower for the day. For a key reversal bottom, the characteristics are the same. The selling climax has to have heavy volume with a wide trading range which first breaks to new lows, rebounds above the previous day's high and closes higher. Frequently, the highest trading volume and the highest or lowest price of the year will be set on a key reversal day. An island reversal takes gaps to the extreme. It receives its name for obvious reasons. 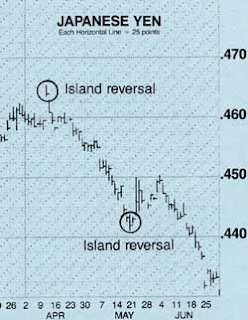 An island reversal can be only one day or a few days of trading above (or below) the previous and following day's trading activity The action is isolated by gaps on both sides. Thus, it leaves a day or a few days of price action surrounded by empty space. The Japanese yen chart shows two island reversals. The 1-day island top of marked the climax of a bull move and the beginning of falling prices. The 3-day island reversal bottom in mid-May signaled a halt to the decline and the Island reversal beginning of a bear market rally. Island reversals occur less frequently than key reversals. The exhaustion gap which marks the beginning of the island reversal will remain unfilled for a lengthy period because the island reversal is usually the climax to an existing trend. Technical analysis is not an absolute tool. Because it is more an art than a science, individuals will interpret formations and trends differently. "Thin markets" - those with very low open interest and trading volume - will create false technical signals. These markets, as well as deferred contracts which also have low open interest, should be avoided by inexperienced traders. This signaled a very strong likelihood that a significant, new downward trend was about to begin.